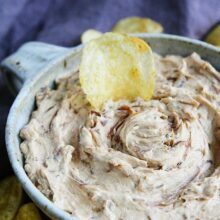 Caramelized Onion Dip-this is the BEST onion dip and the perfect appetizer or snack for any party! It is always a crowd pleaser! This post is sponsored by Kettle Brand. Onions are the star of the dip, but not just any old onions, caramelized onions. Caramelizing the onions makes them extra special, the onions will brown and get sweet. It takes a little time and a little love, but don’t worry the process is easy and the end result is SO worth it. Use a large nonstick skillet. You don’t want the onions to stick and you want to give them plenty of room. You don’t want to overcrowd the onions. Melt the butter over medium heat and add the olive oil. Add the onions and stir until they are well coated in the butter and olive oil. Move the onions around so they are in a single layer in the pan. Cook for about 10 minutes, stirring occasionally. Reduce the heat to medium low. Season with salt to draw out the moisture and add a little sugar to enhance the sweet flavor. Add the fresh thyme. You want to cook the onions slow and low so they have a chance to caramelize. The onions will shrink down and get tender and juicy. This will take about 30 minutes to an hour. Make sure you stir the onions every few minutes or so so they don’t burn. You don’t want to stir them too often though, or they won’t caramelize and brown. You want them to brown, but not burn. Just make sure you look at them every few minutes and give them a quick stir if they need it. If the onions start to dry out, you can add a little water or broth to the pan. In the last ten minutes, add the balsamic vinegar to give the onions flavor. Once the onions are caramelized, the dip is easy to put together. After the onions have cooled for a few minutes, roughly chop the onions with a sharp knife. Place the onions in a medium bowl and add the sour cream, garlic powder, salt, and pepper. Stir until well combined and grab a bag of Kettle Brand chips to get dipping! 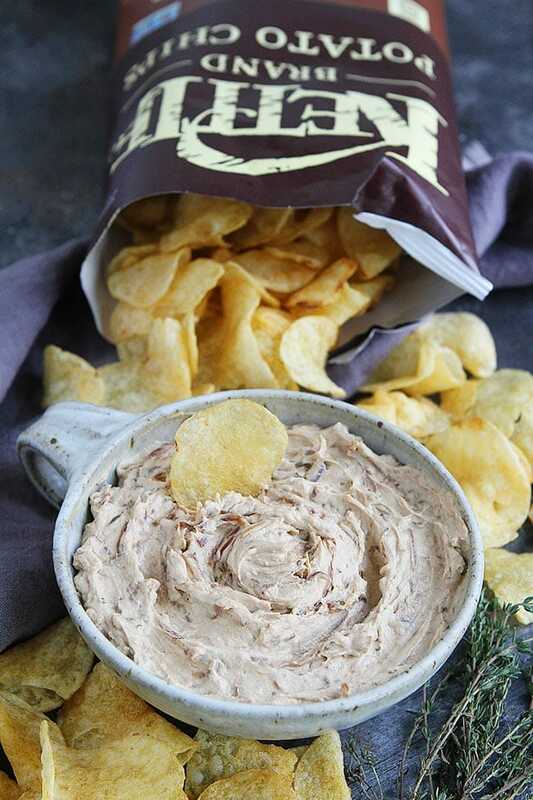 We love the classic Sea Salt Kettle Brand chips with this dip, but don’t be afraid to branch out and try other flavors. 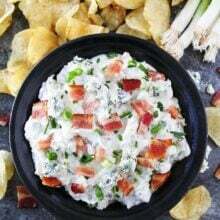 The Kettle Brand Sea Salt & Vinegar and Sour Cream & Onion flavors are also crazy good with this onion dip! 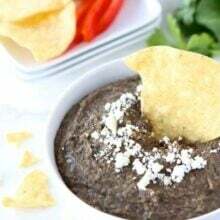 If you are making this dip for a party, go all out and get several bags of chips. Your guests will love having options and I guarantee they will dip until the caramelized onion dip is gone. Don’t be surprised if someone licks the bowl..ha! And you might want to be the first person to get the dip party started because I know the dip does look a little scary. It won’t get any beauty awards, but once people try it, they will be hooked for life. It is the BEST party dip! 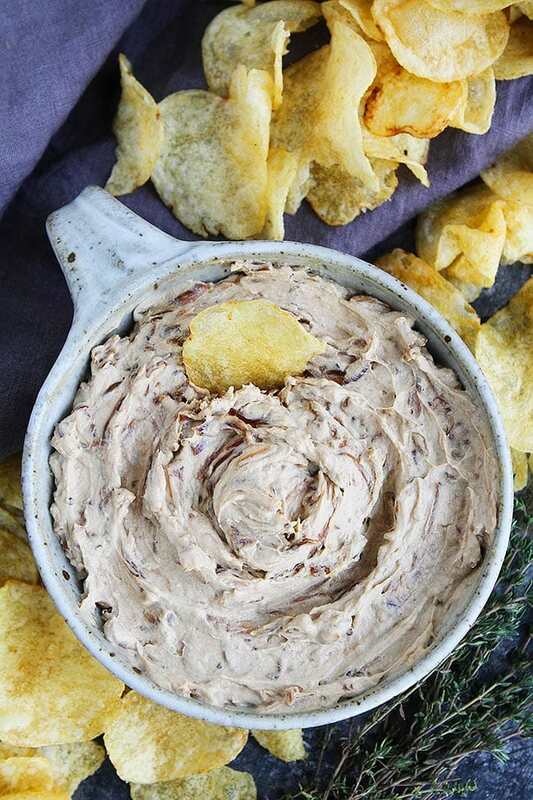 Make this easy Caramelized Onion Dip for all of your holiday parties. 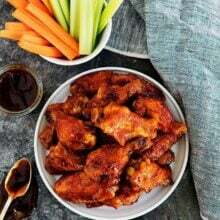 It is also great for game day, pool parties, potlucks, or just because. It is never a bad time to eat chips and dip! 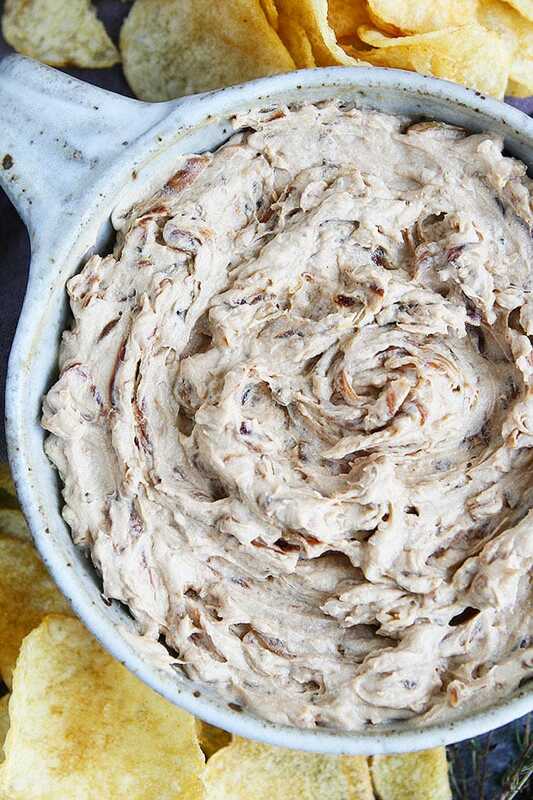 This easy caramelized onion dip is the perfect party food! Serve with chips for the perfect appetizer or snack. In a large nonstick skillet, melt the butter over medium heat and add the olive oil. Add the onions and stir until they are well coated in the butter and olive oil. Move the onions around so they are in a single layer in the pan. Cook for about 10 minutes, stirring occasionally. Reduce the heat to medium low. Season with salt to draw out the moisture and add a little sugar to enhance the sweet flavor. Add the fresh thyme. You want to cook the onions slow and low so they have a chance to caramelize. The onions will shrink down and get tender and juicy. This will take about 30 minutes to an hour. Make sure you stir the onions every few minutes or so so they don't burn. You don't want to stir them too often though, or they won't caramelize and brown. You want them to brown, but not burn. Just make sure you look at them every few minutes and give them a quick stir if they need it. In the last ten minutes, stir in the balsamic vinegar to give the onions flavor. Turn off the heat and carefully transfer the onions to a cutting board. Let the onions cool for a few minutes and then roughly chop them with a sharp knife. In a medium bowl, combine the caramelized onions, sour cream (Greek yogurt), garlic powder, salt, and pepper. Stir until smooth and onions are mixed in well. Serve with Kettle Brand chips. Keep the dip covered in the refrigerator for up to 4 days. It can be made in advance. Follow Kettle Brand on Instagram! Thanks for sharing this recipe, it’s very delicious. 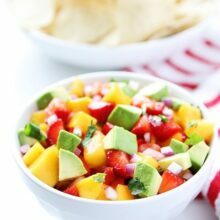 This dip looks like such a crowd pleaser! 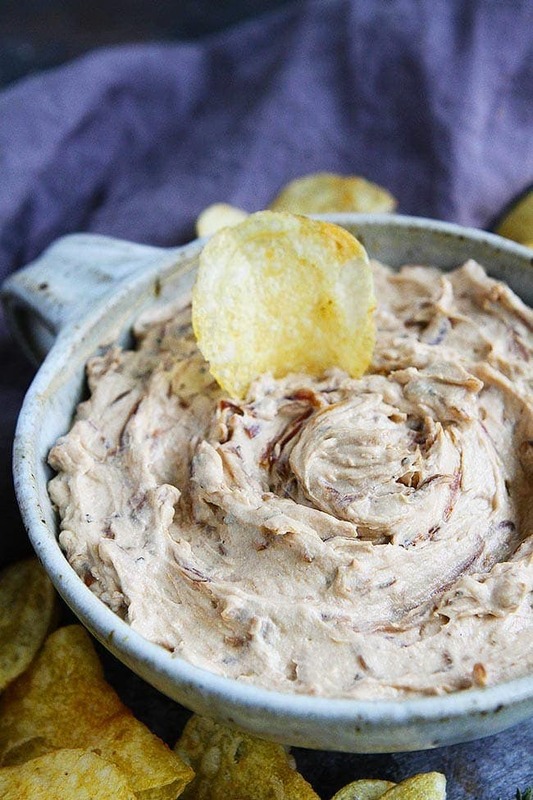 The caramelized onion sounds so good, this dip must be very delicious. I can’t wait to try it. Thank you for sharing the recipe! I’m having trouble with the “print” button on this recipe – it’s not actually taking me to the print option. I checked with another couple of recipes on the site, and the print button works on those. Is there a way to remedy the issue on this recipe? Wasn’t sure if thyme is supposed to go in whole or chopped. Does it stay in and get mixed in the dip? Remove the thyme from the sprigs. I updated the recipe to make it more clear. Thanks! So easy and sooooo good! Her recipes never disappoint. Everyone loved this and it was a perfect make-ahead dip. Will definitely be making this again! Are the onions supposed to be put in the pan whole? I thought it was good i did however need to add a lot of seasonings and herbs after adding the onions to the yogurt for flavor.